Trimble has announced a new high-performance field computer for its mapping and geographic information systems (GIS) portfolio – the Trimble® TDC150 handheld. Designed for GIS data collection, inspection and management activities, the TDC150 provides users a rugged solution that has the flexibility of a handheld, a modern interface with open Android™ operating system, and scalable high-accuracy positioning for professional field workflows. The TDC150 provides advanced Global Navigation Satellite System (GNSS) capabilities in a durable, ergonomic and lightweight form factor. With a built-in GNSS antenna, the TDC150 is a scalable solution that allows customers to choose their desired accuracy. Easy-to-use and carry in the field, it features a bright 5.3 in. sunlight-readable touch screen and an all-day battery for continuous work on the jobsite. The handheld comes with Google Mobile Services certification to run Google core applications and access thousands of apps on the Google Play Store. Professional GIS field applications, including Trimble TerraFlex™ software – a cloud-based solution that enables users to easily collect, manage and edit their geospatial feature data – are supported, as well as Trimble Penmap® for Android software and Esri’s Collector for ArcGIS® mobile app. A new innovative TerraFlex workflow uses the TDC150’s onboard rear-facing camera to capture features. This visual aid shows users when the camera and receiver are aligned over features, enabling horizontal centimetre accuracy when holding the device. 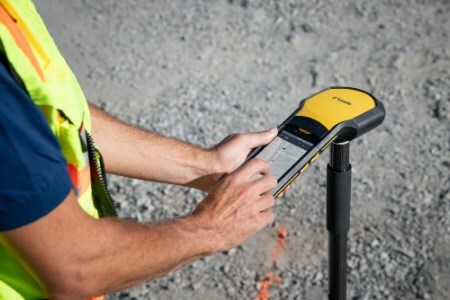 The Trimble TDC150 handheld is available through Trimble Geospatial Distribution Partners. Trimble Geospatial provides solutions that facilitate high-quality, productive workflows and information exchange, driving value for a global and diverse customer base of surveyors, engineering and GIS service companies, governments, utilities and transportation authorities. Trimble's innovative technologies include integrated sensors, field applications, real-time communications and office software for processing, modelling and data analytics. Using Trimble solutions, organisations can capture the most accurate spatial data and transform it into intelligence to deliver increased productivity and improved decision-making. Whether enabling more efficient use of natural resources or enhancing the performance and lifecycle of civil infrastructure, timely and reliable geospatial information is at the core of Trimble's solutions to transform the way work is done.